The Prick of Conscience is an early thirteenth-century didactic devotional poem and is one of the most circulated English verse texts with over 178 witnesses (manuscript copies of the poem). The poem itself follows the cura pastoralia tradition of producing edifying texts for a lay Christian audience: it is a religious text which could be easily accessible to an audience that was unable to read Latin, the language that most religious literature of the time was written in. 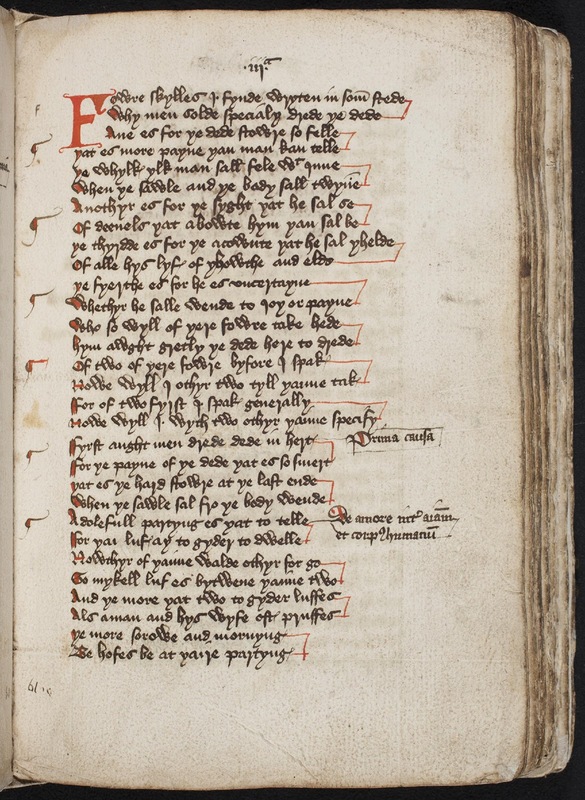 Wellesley College MS 8, p. 61. This gloss announces to the reader that a list is beginning. One witness of the poem is contained in Wellesley College MS 8. This late fifteenth-century copy contains an unexpected feature, however. While most of the text is in English, the manuscript also contains glosses. These glosses, unlike the main text, are composed in Latin. This poses an interesting question: why are the glosses in Latin if the main text is in English?